Sales are the most important function for any business organization, no matter how large or small it may be. Without sales a company simply cannot exist. This is why leads are considered as the lifeblood of a company. Flow of quality leads assures that the business continues to function as it is and even grow. Companies perform various tasks to get leads. They launch special offers, declare big discounts or launch coupons to attract the customers to their products/services. But trying to generate leads using the internal staff is not a viable option. Lead generation is a specialized marketing area and it requires experts. Now, recruiting a team of experienced professionals for lead generation is not a cost effective option. It may even tax your business profits. So, using the lead generation services from a reputed company is the best solution. 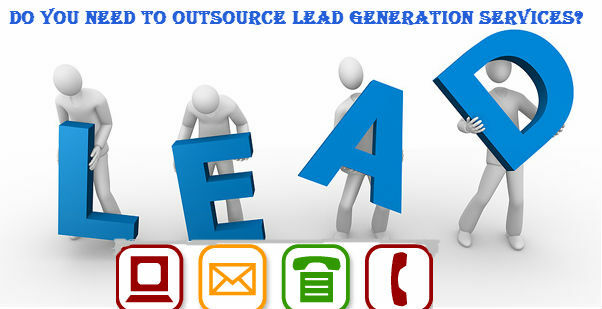 Outsourcing the lead generation tasks is not a luxury; it is an essential need for the companies. Having a large in-house team of lead generation experts can put extra burden on your revenues unless it is a part of your service offering. Now, some companies try to get the job done by their own sales team. This will save the costs no doubt, but it will count for nothing. Only experts know the best ways to reach out to the customer base. But there are many companies which are uncomfortable with the notion of outsourcing the lead generation tasks, so below is a check list that will help you understand whether lead generation at your place needs to be tackled in-house or should it be outsourced. Managing a Team which calls for lots of knowledge: Sales in any business sector is very competitive and hard to achieve. So, the lead generation teams needs a clear understanding of the metrics that they are trying to achieve. This will mean there is need for a lot of managerial oversight. At times, the time for managerial oversight is one hour per hour of sales representative’s work. So, managing such a team requires a lot of dedication and time. You have to encourage and motivate the representatives continually to get the best out of them. There is also need for systematic training, which removes the confusions from the task. When you outsource the task to a reputed company all this time and effort can be saved. The managers have to only look through the reports to assure lead qualification. Use of Technology: Offers are launched to bring in large volumes of prospects. To measure the metrics of a campaign there is need for technology. All the tasks such as call logged and call attempts should be measured by a system. The managers of the lead generation team have to categorize all the calls, to understand which of their representatives are attracting maximum sales. They have to also understand what the reason for a certain person’s success is and help spread the secret formula across the team. Modern technology helps measure the scripting strategies, follow up attempts and compare results. These technologies are already in place at a company offering lead generation services while arranging for the same at your place can be very costly. Meeting the Data Requirement: Successful sales campaigns thrive on good data. If the quality of data is good, you are assured of getting a high ROI from the sales campaign. There are certain ways to get good data such as: custom lists, data resource, buying a ready-made list or researching for own leads. If the representatives have to conduct the research tasks then the productivity is sure to be low. So, let an organization that has separate research and representatives’ team handle the lead generation tasks. Measuring the Success of Campaign: It is important to set the criteria for success. The paradigms should be set loud and clear. This is where some of the businesses fail. The representatives do not know the definition of success and expectations from them. To achieve the goals there is also need for goal based training, scripting and campaigns planning. If all these areas are not covered then achieving the right results becomes a very long process. This is why when you outsource lead generation tasks the results are so quick, as the companies have a ready infrastructure in place. If you thought so long that hiring the experienced sales representatives is the only investment needed to start sales or lead generation campaign, then you have just read the first chapter in a long novel. There are many technologies and expertise that you have to invest into to get the high return on investment. In the present market situation spending a fortune to create an in-house lead generation team is not an ideal decision. So, outsourcing the lead generation services is the best choice. Posted in Lead Generation Services. ← How To Organize The Desktop Of An Agent?